CORPUS CHRISTI, TX – Are you looking for fun and stimulating activities for your child after school ends? Register now for the Corpus Christi Parks & Recreation Department’s Latchkey Summer Camps program. This fully licensed camp program, open to children ages 5 to 13, features a wide variety of activities to help your child make the most out of summer. The program is licensed by the Texas Department of Health and Human Services, so parents can rest easy knowing their children will learn and grow in a safe environment. Each camp meets high standards for child care and all personnel are certified in CPR and First Aid. The camps will allow each child to explore their creativity and participate in physical and social play. Activities will include swimming, tennis, arts and crafts, guest speakers and field trips. Along with the various activities available, our enthusiastic staff is professionally trained in child development and age appropriate activities. Free lunch and snacks will be provided to all qualifying sites through a grant from the Texas Department of Agriculture. Berlanga Elementary School 4120 Carroll Ln. Schanen Elementary School 5717 Killarmet Dr.
Smith Elementary School 6902 Williams Dr.
Magee Intermediate School 4201 Calallen Dr.
Flour Bluff High School 2505 Waldron Rd. Fee: $99/week/child at Corpus Christi ISD sites. $89/week/child at Calallen and Flour Bluff ISD sites. Tuition assistance is available for qualified participants. Must pay one week of tuition at the time of registration (check or money order only). NEW Texas Workforce Commission participants must be pre-approved prior to registration. Tuesday – Thursday, May 22, 23 & 24 from 5 pm – 7pm at the camp site where your child will attend. 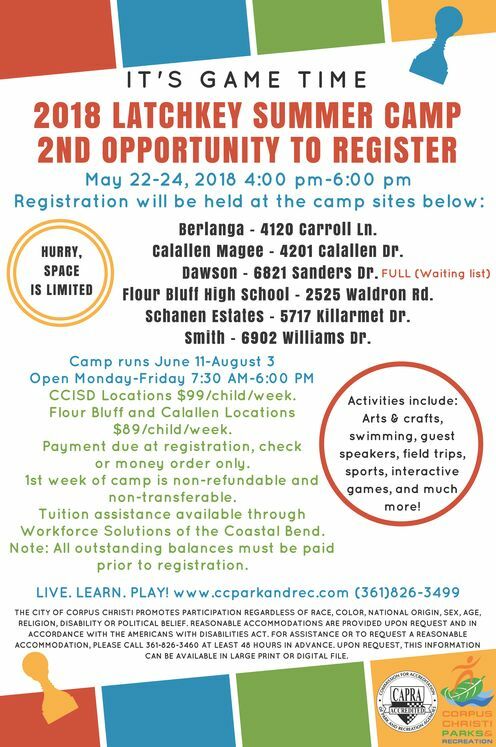 Registration for the Flour Bluff summer camp site will be held at the Flour Bluff Primary site (537 Hustlin Hornet Drive). Wednesday, June 6 from 10 am – 1 pm at summer camp sites (pending space). Once the camps start, please call for availability. Reasonable accommodations may be requested for a child with disabilities by contacting Program Manager John Delgado at (361) 826-3491 . For more information, call (361) 826-3499 or visit www.ccparkandrec.com (Latchkey Program). We invite your children to Live. Learn. Play!